A crown is an artificial restoration that fits over the remaining part of a prepared tooth or a dental implant. A cap makes the tooth or implant strong and gives it the shape of a natural tooth. A crown is also sometimes known as a ‘cap’. Crowns are attractive! You dentist can design and build a crown that fits perfectly with your other teeth. The color, shape, and size of a crown can be adjusted so that a crown can give you back your beautiful smile. Crowns last a long time! A crown normally lasts from five to ten years and can last even longer. Often, insurance covers replacement after 5 years! Crowns can help you avoid other dental procedures that are more expensive. Crowns perform like your natural teeth. Once in place they are strong and permanent. There is no need to worry when you bite or chew. Crowns can be used to treat very large cavities that might otherwise call for a root canal or even an extraction. A crown “restores” a tooth’s original strength and function. Crowns protect weak teeth and can prevent the need for them to be pulled. Crowns are for the long haul! Because they are fixed in your mouth, they do not move around. Some dental appliances can move, drop out, or get lost. Once crowns are placed? They stay there! This study tracked the success rate of 2,340 crowns installed by one specialist. It showed that at 10 years, the success rate was 97% (2,270 crowns that lasted over a decade). At 25 years, the success rate was 85%. That’s 1,989 out of 2,340 crowns that lasted over 25 years. Source: International Journal of Prosthodontics . 2013, Vol. 26 Issue 2, p151-160. 10p. 2 Color Photographs, 4 Charts, 6 Graphs. 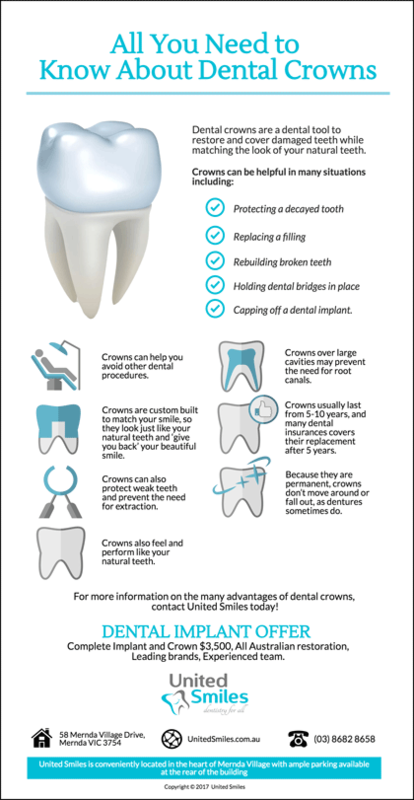 Dental crowns can be an important part of your dental health! Visit your United Smiles dentist to learn more! Experience the difference of wearing high-quality dental crowns in Mernda. Call United Smiles today on (03) 8682 8658.